Pansentient League » What’s New on Spotify? Who Knows! What’s New on Spotify? Who Knows! 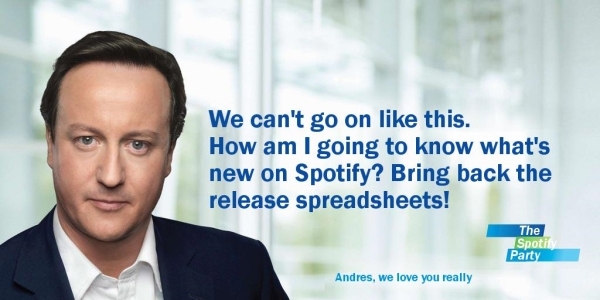 Up until the end of November 2009, every week or so Spotify would release Google Spreadsheets detailing what new tracks had been added. This gave listeners a chance to find out what was new on Spotify, as well as providing a mechanism for community sites to offer recommendation services based on new releases. Unfortunately, Spotify has since decided to stop informing users about what’s new. Since the last spreadsheet came out there have been over half a million new tracks added to Spotify, but other than guesswork there’s no way for users to know what these new tracks are. Spotifyfm, Freshspotify, Spotifyrelease and other community sites all used this process to power their services, offering users a way to filter the new releases based on their particular tastes. Many blogs and websites also depended on this info to post about their favourites. The net result was that the artists and labels all got free promotion for new and back-catalogue updates. So now there’s no way to know what’s new on Spotify. Record labels are adding content every week but no-one knows about it. If we don’t know what’s new, there’s no way for us to listen to the new music. There’s no way for us to tell our friends what cool new songs there are to listen to. There’s no way for bloggers and tweeters to help promote the new tunes. All this would seem to hurt the labels and hurt the artists. On their blog, Spotify will now sometimes cherry-pick a few new releases to mention based on the artist’s popularity. But only the well-known and established artist will be linked: we’ll hear about a new Lady Gaga album for example, but not about the thousands of other new electronic releases. The “long tail” of less-popular music is ignored. Established artists are fine either way, but lesser-known up-and-coming bands now find it even harder to get their music heard, despite it being available on Spotify and ready to generate a bit of revenue for them. Spotify acknowledge that this is an issue but say that it’s not a priority to fix. I think this is a real shame as it’s crippling the very community that Spotify claim to depend on to help spread the message. Before the spreadsheets went, the highlight of my week used to be checking a site like Spotify.fm to see what new gems were on Spotify. Now I’ve no way of knowing. There is a glimmer of hope, however. Spotify rep Andres Sehr says that “most likely the only way we’re going to solve this is in-client or via API. Unfortunately these solutions are much more work to implement.” So it seems that a solution is possible, but we won’t see anything in the near future. Until Spotify sort out this problem, here’s a few suggestions on how to find out what’s new on Spotify. UPDATE: This site now hosts an auto-generated list of new releases! Just click the New on Spotify link at the top of any page. The page lists a selection of new releases from the past week, sorted by artist and with an indication of which countries each release is playable in. It’s not ideal: the list is random (according to Andres) and maxes out at 1,000 – in other words, it’s not a complete list. Big thanks to Steve for the suggestion and Andy for the code. I maintain a small list of my favourite record labels with a count of how many tracks they have on Spotify. You can click a link then compare the track count to see if there’s anything new. New music is always at the bottom of the list in Spotify, so scroll right down to the end. New tracks will have blank popularity bars. I recommend a mouse with a geared scroll wheel (“hyper-fast scrolling“) such as the Logitech MX620. This lets you scroll to the end of a list with only one whizz of the wheel. Finally, you could just randomly type in some band names and see if you get lucky. This is the only way currently to find out about back-catalogue additions. I raised a support issue with Spotify about the “Lack of New Release Notifications” – see there for any official updates, and please add your support by clicking the I have this problem too button!